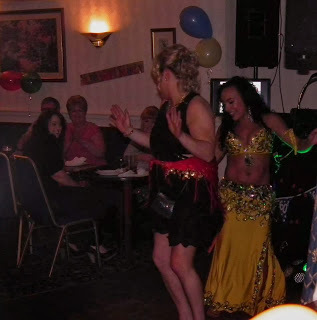 Hire a Belly dancer for a party or event in Merseyside. May cover areas in Chester Cheshire Lancashire Northwales and further. 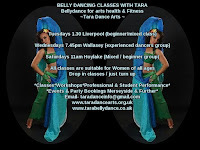 I specialise in providing family friendly belly dancing entertainment for parties and events. Having established myself working at restaurants all over Merseyside constantly over the last four years as well as being hired for parties subcontracted through entertainment agencies and gaining numerous bookings independently I have experience and professionalism however people who book me often comment on my friendly humble and approachable personality so If you are interested in booking an ego free professional and tasteful belly dancer feel free to get in contact with me for a friendly chat and a quote. 10 minutes. The less is more version Designed especially for surprise parties wether at home, down the local pub, Community centre or office. I surprise the guest of honour with a tasteful belly dance set and have her/him dresses up for photographs and have him/her up to dance. No need to worry about CDs or music I bring my own speaker which is loud enough to fill a small to medium room or area and I turn up in full costume which is covered. This is a discounted price because the set is short and ussually performed locally in the daytime or early evening. 20 Minutes. Most belly dancers offer this style of set that is designed for all kinds of events and parties. With several skilled and classy Performances followed by guest participation. The aim is to have everyone up dancing having a good time. Coin belts and other props may be brought for guests to wear and return. Suitable for events where you want variety throughout the evening. Wether it's a Performances, Meet and mingle or guest participation this booking would be suitable. I've provided varieties of sets at weddings, Restaurants, Larger Arabian themed events, Clubs and Community/ Arts/Culture events. Sets are ussually 10, 12 or 20 minutes long. Popular one - x2 15 minute sets with a break inbetween and a costume change. Includes a Performance and a belly dancing lesson for the hen and her friends. This is also great for ladies days and girly nights in. At home or at a venue, Community centre hall, function room or dance studio. * Please note that I do not organise a venue. 20-60 minutes - depending on age and attention span. Fun dance lesson with party games, use of props and coin belts and face jewels provided. The birthday girl or boy gets a special gift. All children receive a certificate. Have it at home if you have the space or hire a dance studio or community hall ect. I offer dance lesson workshops that include performance. This gives the public a positive view of belly dancing as an artform and also give everyone an opportunity to learn some of the moves and steps. I include information on the history and culture whilst teaching techniques. Coin hip belts and other props are provided for all to wear and return. My workshops have been featured on TV whilst I taught at WHISC in Liverpool. Other organisations I have provided workshops for include local schools, Wirral Older People's Parliament and Refuge Wirral Women's & Children's Aid. *Throughout the year I volunteer my service however most occasions I am booked for I will charge even just to cover costs. This makes it a fair exchange. If there is a large amount of funding I will expect full payment. *Where possible I try to stay inline with what other entertainers charge in the northwest. This is a fair rate without the agency fee if booked through myself personally. If booked through an agency or referral website I am not responsible for the extra charge. Thankyou.